Gaining admittance to the ‘other side‘ of the World Wide Web…the side that gets to create all the content, via either a personal website or blog. Or, via media creation and sharing sites (for example videos) at sites like YouTube or Vimeo, has become both easy and fun! Things weren’t always this simple. But by 2015, the year in which I’m writing this…it’s not only possible but likely! For someone like me, someone who’s literally bursting at the seams with ideas (albeit ideas mostly manifesting from a severely ADHD-addled brain) and who has really, no other good means for sharing those ideas…especially with the right audience, a personal website presents the perfect opportunity. My entree into the world of www was slow paced, guarded, and unusually circuitous I think. In hindsight I now realize that sites like WordPress.com can be perfect for ‘beginners’ and had I started here, that course may have been drastically altered. I’ve tried before to document and then to remember to keep up-to-date with my learning process as I navigate the waters of the World Wide Web. But I’ve utterly failed at the ‘keeping up-to-date part. My path to knowledge began at Weebly, where I learned enough to realize I couldn’t do this all on my own. So I joined a community of bloggers that seemed very geared towards teaching beginners all the ropes. huh? what’s a community blogging? I learned that there were these communities of bloggers that welcome newbies. That they try very hard to teach one everything they need to know about blogging. These communities help people to connect also, and to build up their own community of like-minded individuals to share ideas with. Much later I learned that WordPress.com also has communities like this. But by the time I’d arrived here I had other goals. So I didn’t seek out these communities or even feel that they were something I’d benefit from at my stage of development. My chosen community to begin learning was the now defunct Squidoo…it was a great place to both learn and share ideas with others at my same level. But towards the end of my year and half tenure there things began to get more and more difficult. The most absurd situation was for me when Squidoo began a program of tightening their standards for what they felt constituted quality posts. 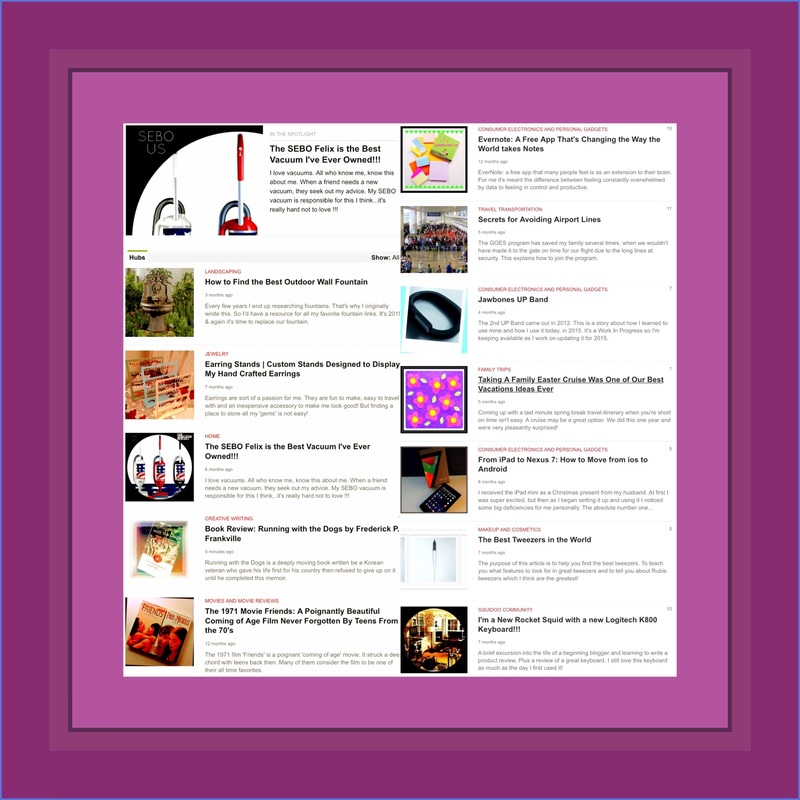 I’d written a new post that was selected to be highlighted in a ‘Top Posts of the Week’ group. It was a labor of love about my Dad and his buddies during the Korean War. This was a very high honor within the Squidoo community. It was also the first time that I achieved such an accomplishment. Sadly, my happy feeling of satisfaction was short-lived because I received an ‘automated‘ or ‘robot generated‘ email the following day telling me that my post had been ‘locked’ which meant that it was essentially shut down due to ‘violations’. Yet those violations were never explained at all, I guess because it just an automatic process. What was even more frustrating to me was that this was apparently a ‘final decision’…there were no means to appeal or adjudicate the locked action. I was left to try and figure out what was wrong by all by myself. My potential new audience couldn’t even read the article that I was really pretty proud of. It took me almost 2 days to try to find a way to appeal the adjudication because, at that point in time, although us newbies didn’t know it yet, Squidoo was deep into the process of shutting down completely. In the end I was able to reverse the decision made by the robot…but by then the damage had been done. I’d wasted almost 2 days of my time and the moment had passed for me to gain new readers. Looking back, this situation was probably entirely due to the process that was occurring behind the scenes…that of shutting the site down. The leaders at Squidoo took great pains to carve out a transition for their large community. They made it easy to export our content and articles to a similar venue called HubPages (which was one of the places I’d considered prior to joining Squidoo.) HubPages ended up being a great community too, and I still have some articles there. But the transition was still a lot of work. Porting my content resulted in essentially needing to rewrite and reformat everything. All my photos looked awful there…somehow the resolutions had been downgraded a lot. So I had to find and re-upload a couple hundred photographs too. Ultimately, I became really bogged down in all of this and completely frustrated in the amount of time I was spending just re-working my old content. More importantly, I never really had any time to actually write new articles and tips…which, in case I haven’t made it clear yet, is the part that I really love! That’s when I decided to take matters into my own hands and to create my own site where I could have complete control over everything. I’d certainly run across WordPress many times…in fact almost all of the blogs and personal websites that I most admired were created here. It was the both the sheer quantity or number WordPress sites I’d encountered, as well as their degree of professionalism (or their beautiful, simple designs) that sort of scared me away. I was a beginner, prone to making lots of mistakes, and I didn’t feel I was ready for WordPress yet. I didn’t want to embarrass both myself or the WordPress community! I feel this way because at last I’ve found a place where I can be myself. A place where I can work at improving my writing while also providing some useful tidbits of knowledge to others along the way. A place where it feels like right now is the time to take one more stab at helping others do the same thing. Last and most important to me, a place where everyone can be truly unique, yet still greatly admire and relish those differences. Rather than attempting the method of ‘journaling my learning progression‘ again, I’ve decided to make this part of my site just like all the others…where I share just small bits of (hopefully) useful information and small pieces to a much larger puzzle. When I’ve discovered a useful new tool, resource or method for doing something, I may write about it here. I’d like to encourage my dear readers to engage more in this section if they’re interested. Personal engagement through comments for example, isn’t something I’ve encouraged or sought out much in the past, or at least since joining WordPress. But for this topic I think, it is appropriate and 2-way comments could potentially be really beneficial for both my followers and for me. Check back here occasionally for new ideas…or subscribe to my site, either by email or, if you too have a site on WordPress or just want to setup a free WordPress account to follow bloggers and sites you like, through the Reader option. You can do this by looking for the blue ‘Follow‘ button in the right hand column of any page on my site. Anyone can setup a free WordPress.com account without actually having a website or blog. I discovered this when a family member chose to follow me using this method. WordPress has this great Reader Section. It allows you to create your own highly curated way of keeping up with the news. I absolutely love it and I use this feature primarily on my iPad, via the WordPress ios app. I love the clean simple design of the Reader Section (just like I love the clean simple designs of most WordPress sites themselves!) I hate subscribing to newsletters and having things that fill up my inbox! So, whenever I can, I follow someone’s blog or website using the Reader method. Sometimes I won’t follow someone on WordPress that I normally would otherwise, just because they don’t provide this method for engaging their followers. If you want to enable this on your own WordPress.com website, just go to your site’s Admin Dashboard, and towards the bottom, under Appearance, is a menu item for Widgets. Look for the widget called the ‘Follow Button.‘ Once you add this somewhere, either in the sidebar or the footer for my theme, your Follow Button will appear on every page or post for your website. Writing for online purposes is a little different than other kinds of writing. To be successful, you need to write shorter sections that ‘grab readers’ attention. You need to use more headlines or titles that act as a ‘virtual’ table of contents. It’s also a really great idea to break up blocks of text with illustrations and photographs that contribute to your main ideas. This is harder than it sounds. For me, the illustration part is the most time consuming aspect, and I’m purposefully not using it much here. My reason for doing so is because I want my commentary here to flow…just like it would it you were reading a letter. I have only been blogging here for 6 months, the first 2 I only wrote every once in awhile. Thank you for all of these awesome tips. Your welcome, and thanks for visiting my blog! I changed Tip #2 because I figured out how I had added my ‘Follow Button’…just in case you were wondering. Your blog is really great…very polished I think! Much more so than mine was at a similar stage! My first 2 months posts really need going over but Not a priority because they are harder to get to and not many people can find them now. My tagged and categories were different. Still needs to be done those. I think I’m lucky that some of my earliest things were lost! Have a great week too…or what’s left of it! I am having a good week so far.